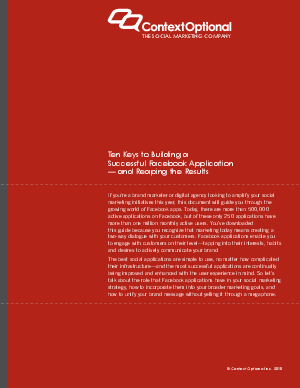 If you're a brand marketer or digital agency looking to amplify your social marketing initiatives this year, this document will guide you through the growing world of Facebook apps. Today, there are more than 500,000 active applications on Facebook, but of these only 250 applications have more than one million monthly active users. You've downloaded this guide because you recognize that marketing today means creating a two-way dialogue with your customers. Facebook applications enable you to engage with customers on their level-tapping into their interests, habits and desires to actively communicate your brand.